Over the years, with the huge advancement of technologies, you can certainly expect that 2018 is going to be yet more invigorating and spectacular! And, when it comes to e-commerce then a more dynamic scenario is being envisaged. It’s because it is one of the most buzzing developments of today’s era. People of almost every country, every region, every culture are being the die-hard fans of the concept of purchasing online. And, they just can’t think of such episodes of shopping anymore when people used to roam around while being laden with those big shopping bags. Moreover, the foundation of an appealing e-commerce website lies in multiple significant factors. And, among all these, the three most eminent elements are the design of the website, developmental strategy of the same and the mobile compatibility. And, fortunately, in the coming year i.e., 2018, experts are foreseeing a huge restoration of these technological aspects. So, if you are a yet another frequent online shopper then get ready for some striking exhilaration and amusement like never before. However, today, here I am with a rundown of some of such most prominent predictions regarding web-designing, web-development and mobile trends of e-commerce. Excited to know? Then, without any more ado, here I go! 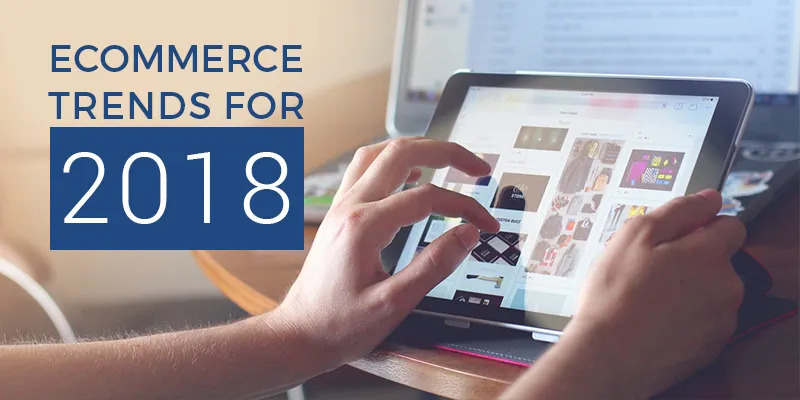 Forthcoming trends of e-commerce web-designing: The following attractive trends regarding web-designing are going to cause an immense impact on e-commerce in 2018. Bold and Bright Colors- 2018 is definitely going to be a year of vibrant colors!! Till now, you might have seen the e-commerce websites sticking to the conventional web-safe colors which are consistent on any computer. But, the picture is going to change soon! !You can certainly expect to see the brands coming up with vivid color palettes with more creativeness incorporated within the same. Especially, the start-ups are more likely to include vibrancy in their branding while hoping for great customer-attention. Custom Illustrations- We have noticed that illustrations have been a versatile addition to the e-commerce websites until this year. And, it is expected that these are going to be the star in the coming year. The online sellers are more likely to incorporate illustrations into their websites while adding them into the header images, custom iconography, bespoke fonts, and animated visuals. I can foresee that such custom illustrations are going to become a significant part of the identity of almost all brands. Video Effects- No doubt, videos are trending in today’s era! And, why not even? The moving images automatically capture more attention than the static ones. Right? With the incorporation of videos, there would be a great level of engagement of course. Moreover, the online authorities like Facebook, Twitter, Google etc. are looking at videos more favorably. So, in 2018, it is going to be an ever greater trend! Impending trends in e-commerce web development: When it comes to the web-development of e-commerce websites then these upcoming modernized trends are going to change the story for extreme betterment. Want to know about the same? Then, just read ahead! Virtual sales assistance- Online shopping is, of course, something quite convenient. Right? But, the one most disturbing complication that we face while doing so at this point in time is nothing but the absence of a chance of interaction with the sales assistants. Well, 2018 is going to improve the scenario for the best! There will be various bots available in the e-commerce websites which will be programmed in such a way that they would respond to various customer queries. This is going to be a remarkable upliftment in the concept of web-development for e-commerce. Convenient returns- In the contemporary era, one of the main drawbacks of e-commerce is nothing but the perplexing return processes. But, the web-developers are expected to develop an automated return processing system in 2018 through which the returns would be based on software solutions. Thus, the customers will be left with a very user-friendly portal to return the orders easily that they haven’t liked. Internet of Things ( IoT)- The recent research by Mckinsey revealed the fact that e-commerce websites would increase their revenue between 410$ billion to 1.2$ trillion with the help of IoT by the year 2025. So, it is expected that in 2018 the web-developers of various e-commerce websites would connect devices for communicating with the customers, tracking their behaviors, sending the promotional offers and what not! Imminent mobile e-commerce trends: Mobile shopping is going to be even easier in 2018 with these three high-end trends. Have a look! Wrapping Up: Of course, predictions can’t assure that it would turn out to be a reality for sure! But, it is highly expected that these prognosticated trends are definitely going to take the whole story of e-commerce to the next level in the coming year. So, with the hope for a smarter version of e-commerce in the coming 2018 let me now come to an end. Lastly, just keep your enthusiasm up until the next fantastic year arrives! About Author: Joseph Payne is the marketing manager at CouponsMonk.com, deals and discounts provider company. He is passionate about money savings, investment and finance industry. In addition, Joseph also supports non-profit agencies that provide healthcare solutions to handicapped and disabled people.